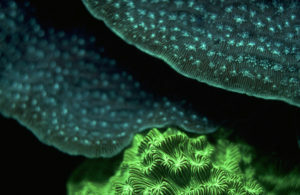 There are many images of subjects fluorescing underwater (check out the Galleries! 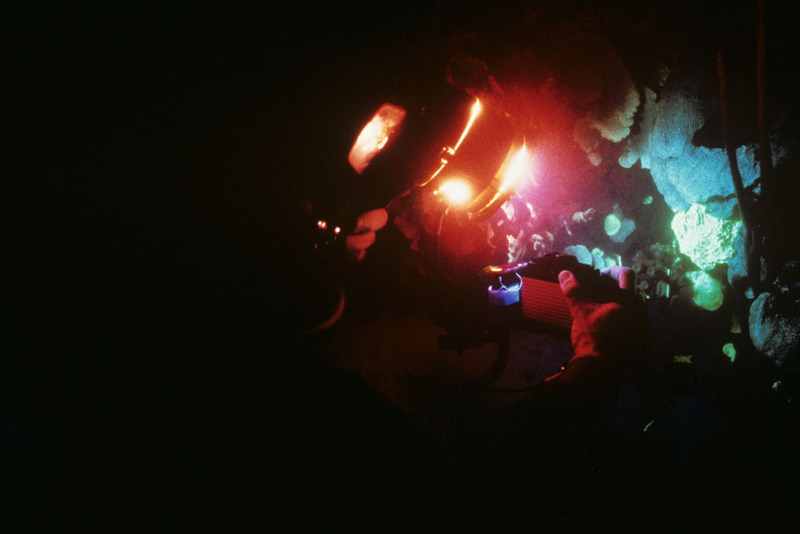 ), but you don’t often see a photograph of a diver in the act of taking a fluorescence photograph. The photo below is from my (NIGHTSEA founder Charlie Mazel) archives of 35mm slides (I hope some of you remember film). This shot was taken at CoCo View Resort in Roatan, Honduras, in 1987. I am the diver in the photo, with my body extending off to the left. You can see my trusty Nikonos camera in my right hand. The bright white light is sideways spill from the strobe (Ikelite 300), but that didn’t reach the subject and you can see the nice fluorescence from the coral. So how did we get the shot? My good friend and marine historian Warren Riess was hovering in the dark with a second Nikonos with a wide angle lens. I would set up to take a shot and when I was ready I would grunt loudly enough for him to hear. Warren would then open his shutter, which was set to Bulb. I could hear the click of his shutter and as soon as I did I would activate my own shutter, firing the strobe and taking my shot. So my strobe flash actually exposed two shots at the same time – I was getting a perfectly good image of the fluorescing corals on my camera at the same time that Warren was capturing this image of me in action.